Matters Scottish are much on the minds of those of us in the UK this week because tomorrow the people of Scotland will vote on whether they wish the country to become independent, or whether to stay within the UK. As such, a trip to see one of Scotland’s transport beauties seems thoroughly in order, so it’s off to the great city of Glasgow. When the Glasgow District Subway Company built a head office, they did so in wildly extravagant style. This was, after all, only the third underground metro in the world, opening in 1896. Not for the Glasgow District Subway Company the great offices of the Great Western Railway at Paddington, or the North Eastern Railway at York, though. No, for the Glasgow District Subway Company, the tiny building which still stands on St Enoch Square was more than adequate. Even then, the company only used the upper of the two floors for its offices. 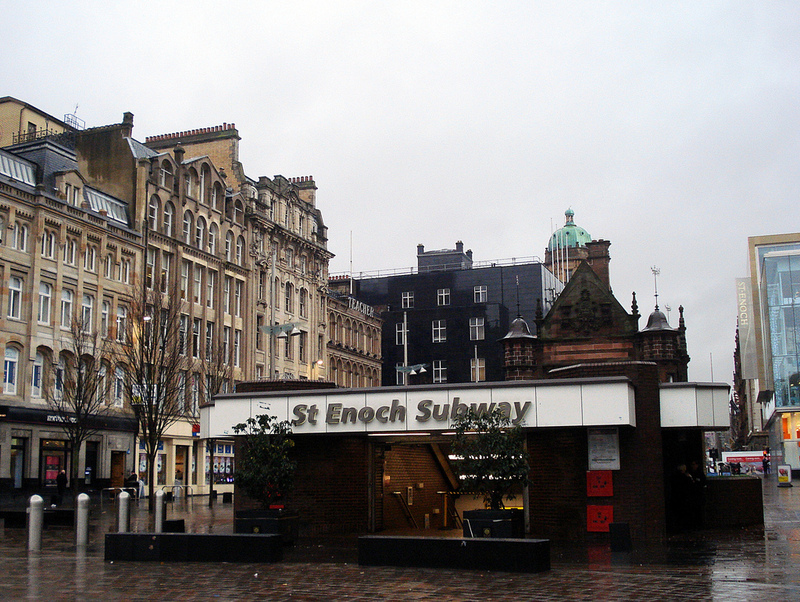 The ground floor, economically, was used as the ticket office and entrance for St Enoch Subway station itself. In this, St Enoch Subway Station’s building was exactly like the rest of the Glasgow Subway, in other words, perfectly formed but a little under-scale. The Glasgow Subway is a loop-shaped network only 6¼ miles long, which seems short considering the size and wealth of Glasgow (various proposals for extensions have never come to anything). It uses a track gauge of four feet between the rails (compared to the standard gauge of 4’8½” used nearly everywhere else in the world). That track gauge is extraordinarily unusual, used only on a handful of urban railways across the entire world. The Subway’s stations are, well, extremely wee, and its trains are and always have been even smaller than the diminutive deep-level tube trains of London. It’s no toy railway though, carrying 12.48 million passengers in 2012/13 (see here). The trains were originally hauled by cables, but the system was converted to electric operation in the 1930s. The Glasgow Subway isn’t overwhelmed with notable architecture, which is surprising in a city that otherwise sports many historic and important buildings. But its St Enoch headquarters more than made up for that. The design of James Miller, the headquarters and ticket office is either Jacobean or Flemish Revival or Flemish Renaissance, depending on which source you’re reading. I tried to work out the difference but got completely confused, so I’ll leave the precise definition to the architects. What I do know is that having got bored with classicism, several architects of the Victorian era plundered other historic styles, a movement which gave us the neo-gothic grandiosities (is that a word? it is now…) of the UK’s Palace of Westminster (by Charles Barry and Augustus Pugin) and the Midland Grand Hotel at St Pancras Station (by George Gilbert Scott). Meanwhile, Jacobean architecture of the 1600s was plundered to give us stately homes like Harlaxton Manor (Lincolnshire, UK), and on a rather smaller scale, St Enoch Subway Station. Key features are the turrets which are corbelled out at each corner, and topped with decorative finials. Dormer windows and a balcony are supported on massive corbels. There are carved animals, obelisks, a clock and decorative gables. Miller took everything in the Flemish Renaissance design sourcebook and chucked it at this tiny building. The slate roof is particularly clever. Its tiles are very small, making the building look bigger than it actually is. 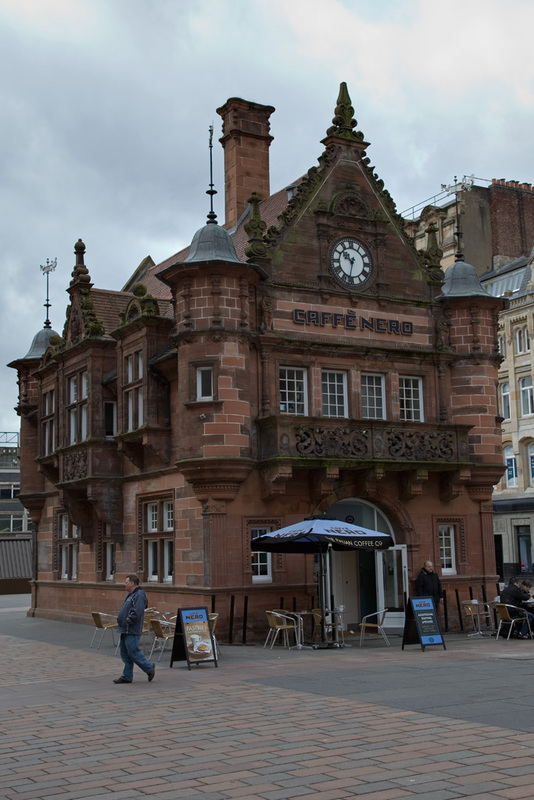 Today, St Enoch Subway station’s street level building is an oddity in the local street scene, a piece of Victorian fantasy in stark juxtaposition with the great glass edifice that is the St Enoch Centre shopping mall, immediately to the east. Until the late 1970s, that site was occupied by St Enoch Station, a huge pile of a place with a typical iron trainshed roofs, and a railway hotel at the front. The hotel was completed in the Victorian Gothic / Gothic Revival style, and the Glasgow Subway station in front would have seemed much more a piece of a greater whole, inasmuch as they were both Victorian fantasies despite drawing on different historical antecedents. You can see some photos of both stations together, here. As part of the process, new entrances down into the station were built. These unlovely structures have never looked anything other than lumpen and cheap. Whilst they may have avoided the trap of pretending to be something they weren’t (unlike the original ticket office) they failed completely to express any attractive aesthetic through their function either. Help is at hand though. A comprehensive refurbishment of St Enoch station is underway, and new entrance canopies to the stairways will be built. According to current operator Strathclyde Partnership for Transport, the new entrances are inspired by the Kibble Palace glasshouse at Glasgow Botanic Gardens, but to be honest that’s a bit of a stretch (make your own mind up by looking at an image of the Kibble Palace here). Lord Foster’s “fosteritos” entrances at Bilbao’s metro stations, and Canary Wharf’s easternmost entrance (a later structure, also by Foster), are the antecedents which spring more readily to mind, which isn’t a bad thing at all. The new structures are certainly more complementary to the old ticket office and the street scene in general than the current ones. Having found itself redundant after the Subway’s 1970s modernisation, the old ticket office building subsequently found a use as a travel information centre before eventually becoming a coffee shop. St Enoch Subway Station’s surface building is a splendid little survivor, having comprehensively outlived its mainline cousin. Its smaller size meant that retention and conversion was a much more practical proposition than for the large mainline railway station. It was listed at Grade A (the highest possible rank) by Historic Scotland in 1970, presumably explaining the whole hovering thing mentioned above, and which should see its future secure. 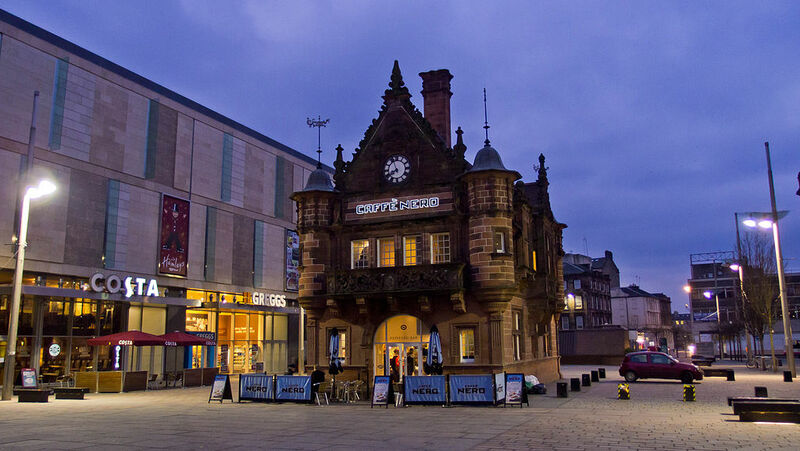 It’s such an odd little building, now so adrift from it roots, that one wonders how many coffee drinkers actually realise the history of the building they are in.